2. Cut a piece of striped paper 9x10cm and stick to the face of the bottle tag. 3. To make the pocket cut a piece of green card 13 by 15cm, score two 1cm folds on either side of the pocket and two 1cm folds on the bottom of the pocket. Cut a 2x2cm square out of the bottom of each pocket corner to help the sides fold. 4. Cut a piece of bell print paper 8.5 by 12.5cm and stick to the front of the pocket. Cut a 9cm oval scallop and layer with a slightly smaller white oval card, stick the large reindeer sticker to the front and mount on the pocket. 5. Glue the sides of the pocket together and adhere to the main body of the tag. Use a strip of red ribbon across the bottom of the tag and glue a brad and bow across the top of the ribbon. 6. 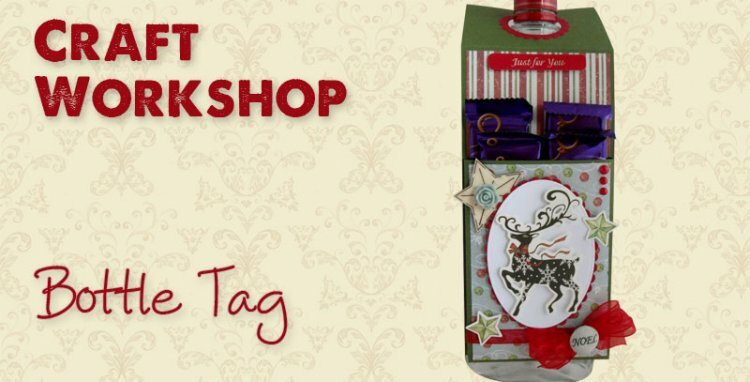 Finish by embellishing the gift tag as shown in the picture. We would love to see your versions of the bottle tag in our gallery , don’t forget to tag it as a gift-tag so people can easily search them in the project gallery.